Where is Sun City Center Florida? The map of Sun City Center, Florida points the way. 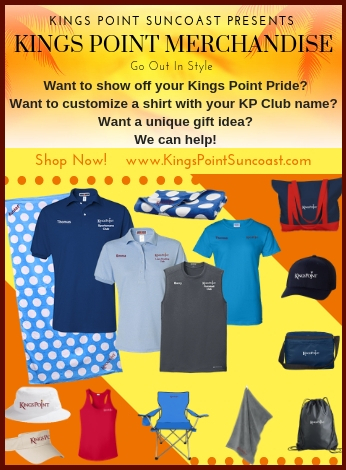 Kings Point, inside Sun City Center, is centrally located on the Suncoast of Florida, just 27 miles south of Tampa in Hillsborough County. 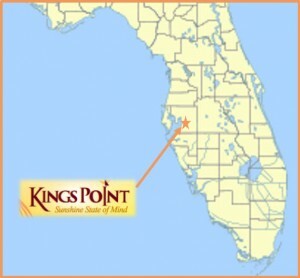 Conveniently located for easy access to Interstate 75, Kings Point residents are only 39 miles north of Sarasota, 36 miles from St. Pete Beach. Just follow the Sun City Center, Florida map and arrive at this active adult community where residents enjoy the benefits of a small town atmosphere and the convenience of nearby cities with sports, entertainment, shopping, airports and cultural amenities including museums, theater. From the North: Take Interstate I-75 South to Exit 240A – follow the signs for Sun City Center onto Sun City Center Blvd. (State Road 674). Go east 1.5 miles to Kings Blvd. and turn right to the Kings Point Gate. From the South: Take Interstate I-75 North to Exit 240 – follow the signs for Sun City Center onto Sun City Center Blvd. (State Road 674). Go east 1.5 miles to Kings Blvd. and turn right to the Kings Point Gate. Visitors are welcome but must be accompanied by a resident or a Realtor.